Illinois Secretary of State Jesse White relayed the message of 13-year-old heart recipient Mikahla Thornton, “Be an organ donor because to the world you may only be one person, but to one person you may be the world,” as he spoke at Northwest Community Hospital Thursday morning. 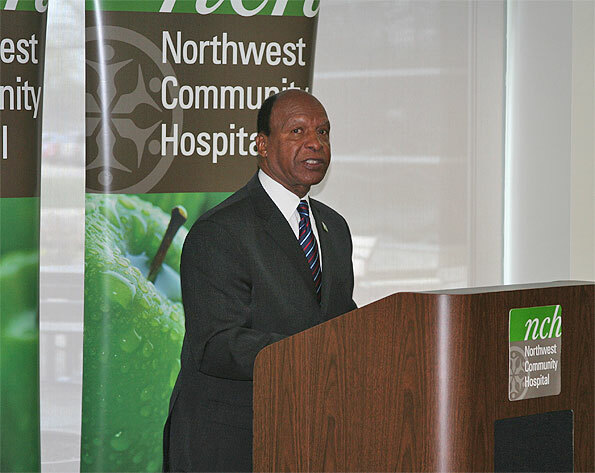 Illinois Secretary of State Jesse White honored Northwest Community Hospital Thursday morning for its commitment to saving and enhancing lives through organ and tissue donation. 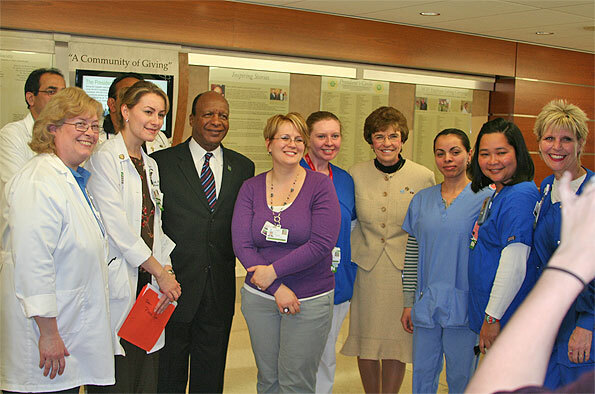 Secretary of State Jesse White visited the Arlington Heights hospital and presented a plaque to NCH leaders. He also toured the hospital’s new Critical Care Unit, where all organ procurements originate. 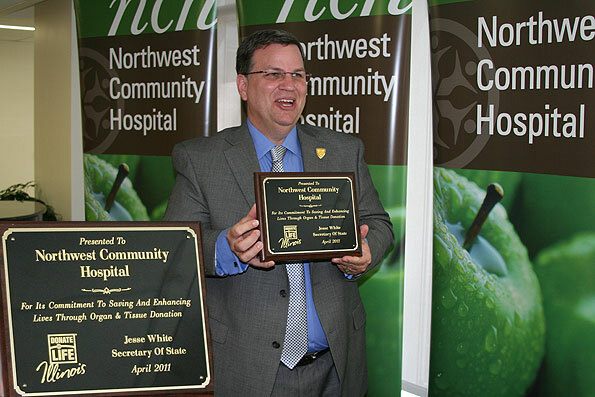 Dale Beatty, Executive Vice President of Hospital Operations and Chief Nursing Officer at Northwest Community Hospital proudly displays a plaque from Illinois Secretary of State Jesse White for the hospital’s commitment to serving and enhancing lives through organ and tissue donation. Secretary White encouraged everyone to become a lifesaving donor by visiting www.lifegoeson.com and joining the registry. April is National Donate Life Month, and many organizations are working to promote donor awareness. Nationally, more than 110,000 people are waiting for organ and tissue donations. In Illinois, approximately 5.6 million people have signed up on the registry. Former Hersey Basketball Coach Don Rowley recalls a down-to-earth moment about his poor vision before receiving corneal transplants, as Illinois Secretary of State Jesse White and Mayor Arlene Mulder respond with the audience with laughter. Joining Secretary White in recognizing NCH today was Arlington Heights Village President Arlene Mulder; President Jerry Anderson from Gift of Hope; Mary Schlereth from the Illinois Eye-Bank; and corneal transplant recipient Don Rowley, former longtime basketball coach at Hersey High School in Arlington Heights. NCH nursing managers take a group shot with Illinois Secretary of State Jesse White and Arlington Heights Mayor Arlene Mulder for the Northwest Community Hospital Facebook page — facebook.com/NCHonline (See also photo album Jesse White Visits NCH, 4.21.11). 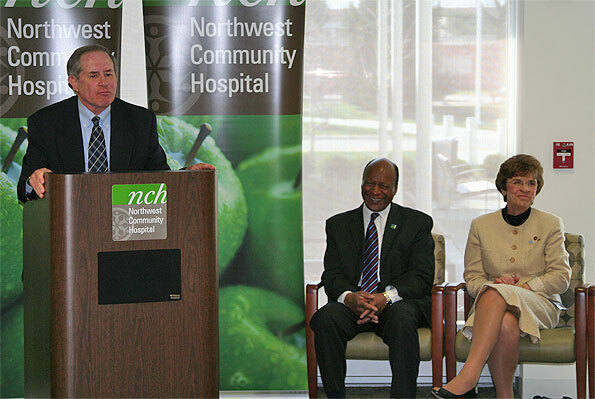 For more information about Northwest Community Hospital and its patient care, visit www.nch.org.